I was probably first introduced to Corsican wine at Café de la Fontaine in Lourmarin, our favorite Luberon village. There, on the small lane that traverses the center of this charming village, lies a string of cafes, including this one. The owner, who I believe is Corsican but in any case, serves up an authentic Corsican charcuterie and has the island’s wine to match. I recall thoroughly enjoying a Corsican red wine on more than one occasion there. So, when Yoko Ota-Sawyer of the Urban Grape in Boston suggested that I might like a bottle of red “E Prove” from Domaine Maestracci in Corsica, I was immediately interested. I had never thought about Corsican wines outside of Provence. (I am not sure I had ever seen a bottle on this side of the Atlantic.) Yoko, who shares my love of Provence, said that when she drinks this wine, she thinks of “a bright sunny coast” and smells the sea with “a bit of saltiness in the air.” Hmmm. I thought for just a moment before I jumping on her suggestion, hoping it would elicit the same feelings in me as I sipped the wine. I took the bottle home and cobbled together a charcuterie to accompany it. The wine was teeming with flavor and brought to mind the bucolic nature of its origin (which is, actually, high up at the base of Monte Grossu Mountain, southeast of Calvi). It continued to open up and we found it increasingly pleasing. Wine has been produced on this island for at least 2500 years. It was one of the main draws throughout the centuries for the Phoenicians, the Greeks, the Romans who, when they weren’t invading a neighboring land, all enjoyed wines made from the grapes that grew wild on the island. In the 11th century, Pisa took control of Corsica and its vines, sending most of them to Italy; in the 12th century, Genoa was in power and continued to send most of the wine to back to Italy; in the 18th century, the French took over but the strong Italian influence in wine production and exports to Italy remained in place. In the mid-19th century, the vineyards succumbed to infestations of oidium and phylloxera, severely damaging the industry. Recovery efforts were met by sharp price drops in the market and then the devastating effects of the First World War. It would not be until the 1970s that the wine industry would begin to recover. Today, the success of this industry is due to sheer determination and dedication to high quality production, including a lot of vine-thinning in the 1980s, together with an expertise in both understanding how to exploit the natural attributes of the island and, especially, how to fully appreciate the indigenous grape varieties (of which there are many!). Finally, learning how to best apply modern technologies to wine production without sacrificing regional character has greatly contributed to Corsica’s growing wine production of exciting reds, whites, and roses. There are more than 40 varieties of grapes–30 of which are indigenous–that may be used to produce wine on this small island (3400 square miles, about twice the size of tiny Rhode Island). Although most of these grapes may only be used to make VDPs, the enormous variety enables tremendous creativity and experimentation in wine making. The most important grapes in the nine appellations are Sciaccarello (indigenous), Nielluccio (Italian, more commonly known as Sangiovese), and Vermentino (Italian, known as Rolle in France). The influence of France, particularly Provence, is apparent in the wide use of Grenache, Syrah, Mourvèdre, Cinsault, and Carignan. Just a quick glance at the map confirms that Corsica is France’s southern-most wine region but what you may not realize is the island lies as far south as the 40th parallel, the same latitude as Rome and Barcelona. So, these vineyards are treated to more sun that any of the other French regions. The climate is temperate, with early spring rains followed by minimal rainfall throughout the rest of the year, leading to predictably excellent harvests, year after year. Interestingly, the island’s winds help to ventilate and insulate the vineyards as well as guard against fungal diseases (enabling many of the producers to adopt organic practices). A closer look at the island reveals an unusually varied topography (valleys adjacent to peaks over 2,000 meters, and as high as 2710 meters), many soil types (e.g., clay, sand, limestone, granite, and schist), and an impressive number of mesoclimates, all of which further contribute to the interesting personalities of these wines. And on the subject of personality, the “E Prove” red from Domaine Maestracci (2010) has a lot of it, all packed into a $20 bottle. Comprised of Niellucciu (35%), Grenache (35%), Sciaccarellu (15%), and Syrah (15%), this wine has a rich but rustic character that reminded me of the Southern Rhone wines I like so much. Appealing from the first taste of earthiness, blackberries, and hints of spiciness, it just got better and better as it opened up. Everyone who tasted this wine enjoyed it. David Campbell, proprietor of Ceres Street Wine Merchants in Portsmouth, NH, commented on its “good color” which, he said, has “brightness” and “clarity.” His nose noted “a little clove” and his palette detected hints of chocolate. Towny Manfull tasted “dark cherries and a little rosemary.” Both Campbell and Manfull remarked on the mouthfeel with Campbell saying that it has a certain fleshiness to it. “Slickery,” he said. Manfull said that it has a pleasing fullness. Both Campbell and Win Rhoades, proprietor of South Street and Vine in Portsmouth, NH, agreed that the wine is well balanced. “Well knit,” Campbell said. “Good acidity,” Rhoades said. Its 13% alcohol content works well in the balance. Rhoades remarked that the fruit comes through on the finish, which he thought was a little rustic and tanniny. He felt the bottle would benefit from a little more aging. The producer, Michel Raoust, who has overseen the operation since his father-in-law, Roger Maestracci, the original owner retired, ages the wine for about two years before releasing it. According to Kermit Lynch, Raoust “allows the red an extended time to age and mellow before release…[g]iven the particularity of the terroir and the diverse influence of the temperature variations and granite soils.” The variations in temperature stem from the domaine’s location on a granite plateau called Reginu, an area known for a micro-climate called “the Prove” that is characterized by “hot and dry” days, “high altitude cool nights,” and proximity to the sea and its winds. We all felt this wine would really come to life with food and indeed Lynch refers to it as a “quintessential Mediterranean food wine.” We paired it with a lamb shoulder braised with red wine and prunes served on top of couscous and thought the match was heavenly. There are many reasons to visit Corsica. Beautiful beaches beckon but the lush hills of the island are also beguiling. Its cuisine, influenced especially by Italy but also by Provence and Spain, is distinctly their own. There are the hearty stews from the same animals that provide the meat for the charcuterie and the seafood soups with lots of garlic that one might expect but there are also lots of savory and sweet dishes made with goat cheese like a tart of brocciu (a ricotta-like cheese made from sheep’s or goat’s milk) and falculella (a type of cheesecake baked on a bed of chestnut leaves), Minestra (a soup of beans, smoked ham, cabbage, and potatoes, and lots dishes with chick peas, swiss chard and rice. There the remains of fortresses, citadels, ramparts, and churches left from those who ruled over Corsica throughout the centuries. There are cities, music, theater, museums, history, and hiking. Did I mention that Napoleon Bonaparte was born in Ajaccio, capital of Corsica? For me, I’d have to visit a few wineries. 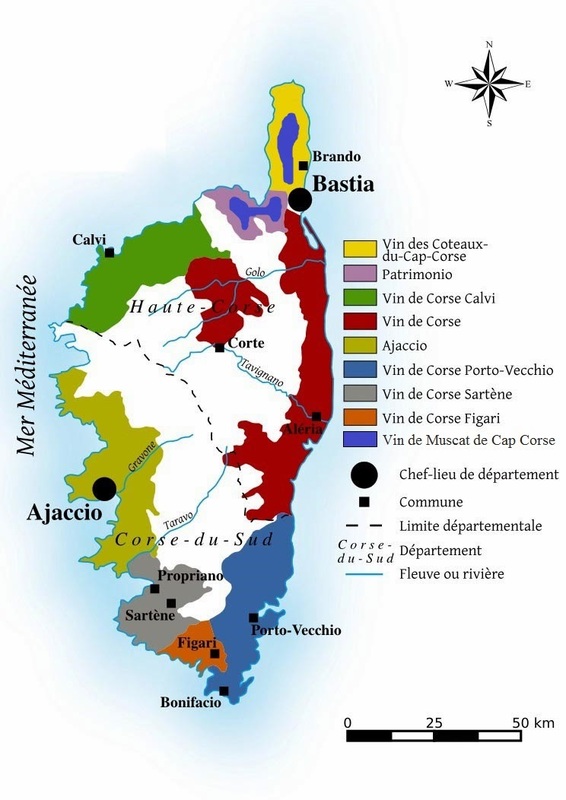 Along the west coast, further south from Corse Calvi, where Domaine Maestracci is located, is the appellation of Ajaccio. There, I would love to visit Domaine Comte Abbatucci, a biodynamic vineyard with an annual production of just 5,000 cases. The vines, grown from cuttings of indigenous grapes from around the island, are the beneficiaries of traditional Corsican music played on loudspeakers located throughout the vineyards and, then, when the grapes are fermented and wine is aged, the same music is played in the cellars. The producer, Jean-Charles Abbatucci, a direct descendant and the namesake of a local hero who was a General in the French Revolution, is a hero of sorts himself around town for the terrific wines from his estate. Wines from Domaine Comte Abbatucci can reach almost twice as much money for a bottle as the E Prove I like so much, which reminds me of what Howie Rubin, the proprietor of Bauer Wines in Boston, said when I picked up the E Prove reds he was able to get for me. “There are more expensive Corsican wines you can get here but, for the price, this is a great value.” I will look forward to trying other Corsican wines to see if I agree. The wine is definitely worth the search and it does go so well with that lamb dish. It is a Mark Bittman recipe from the November 27, 2013 NYT Magazine–there are quite a few that look delicious in that piece. Kathy, Perhaps a tour there?! I thought it was a really interesting and appealing combination of flavors…and the wine went very nicely with it! Will look for the E Prove and the Comte Abbatucci here in Provence. Thanks, once again, for the great info.. I would be curious about other Corsican wines you find. There are some good roses from Corsica that are available in Provence!